Perception of seasonal cues is critical for reproductive success in many plants. Exposure to winter cold is a cue that can confer competence to flower in the spring via a process known as vernalization. In certain grasses, exposure to short days is another winter cue that can lead to a vernalized state. In Brachypodium distachyon, we find that natural variation for the ability of short days to confer competence to flower is due to allelic variation of the FLOWERING LOCUS T (FT1) paralog FT-like9 (FTL9). An active FTL9 allele is required for the acquisition of floral competence, demonstrating a novel role for a member of the FT family of genes. Loss of the short-day vernalization response appears to have arisen once in B. distachyon and spread through diverse lineages indicating that this loss has adaptive value, perhaps by delaying spring flowering until the danger of cold damage to flowers has subsided. Many plants adapted to temperate climates have a biennial or winter-annual life history strategy. These plants become established in the fall, overwinter, and flower in the spring. Essential to this adaptive strategy is that flowering does not occur prior to winter, and that the perception of winter leads to competence to flower in the spring (Woods et al., 2014b). The winter cue perceived in many plants is exposure to a prolonged period of cold, and the process by which such exposure leads to competence to flower is known as vernalization (Chouard, 1960; Woods et al., 2014a). In some plants, however, short days (SD) provide an alternative winter cue (Purvis and Gregory, 1937; Heide, 1994), and the process by which SD exposure leads to competence to flower has been referred to as SD vernalization (Purvis and Gregory, 1937). This phenomenon was called SD vernalization because a hallmark of cold-mediated vernalization is acquisition of competence to flower rather than flowering per se, and the SD-vernalization phenomenon is similar in that exposure to SD leads to competence, but plants must still be exposed to inductive LD to flower. The physiology of SD vernalization has been studied extensively in rye, wheat, barley, and oat (Purvis and Gregory, 1937; Dubcovsky et al., 2006; Sampson and Burrows, 1972; Heide, 1994) although it exists in other families of plants as well (e.g., Chouard, 1960). The study of SD vernalization in wheat and barley is complicated by the fact that there are genotypes of wheat (e.g. Templar) and barley (e.g. Morex) in which flowering per se occurs in SD; that is certain wheat and barley genotypes are facultative LD plants in that they flower most rapidly in LD but also will flower in SD (Kikuchi et al., 2009; Casao et al., 2011a; Evans, 1987). This SD flowering in wheat and barley is distinct from SD vernalization. Brachypodium distachyon (B. distachyon), however, is an obligate LD plant that only has a SD-vernalization pathway and not a SD-flowering pathway (Ream et al., 2014; Gordon et al., 2017; Woods and Amasino, 2015); thus, the SD-vernalization pathway can be studied in B. distachyon without the complication of SD flowering. Little is known at a molecular level about how the SD-vernalization pathway operates in any plant species, and thus we have explored the genetic basis of SD vernalization in B. distachyon. Our work reveals a novel role for a FT-like gene in the SD-vernalization pathway and provides a molecular explanation of the distinction between SD vernalization and SD flowering in the pooid grasses. The model pooid grass B. distachyon has a robust cold-mediated vernalization response (Ream et al., 2014; Gordon et al., 2017). To determine if any accessions also have a SD vernalization response, we grew 51 accessions in 8 hr SD followed by long days (LD; eight accessions shifted into 14 hr LD Figure 1—figure supplements 1A 43 accessions into 16-h LD (Supplementary file 1) or 20 hr (Supplementary file 2)); as controls accessions were grown solely in LD or SD. Flowering time was measured as days to heading and leaf number on the parent culm. Furthermore, dissections on the parent culm were made at the end of the experiment in accessions that did not visibly flower to determine the developmental state of the meristem. Forty of the accessions exhibited a robust SD-vernalization response: these accessions flowered rapidly after the shift from SD to LD, but in LD alone flowering occurred only after quite long periods of growth. The accessions never flowered when grown solely in SD (Figure 1A and B, Supplementary file 1 and S2, Figure 1—figure supplement 1; Materials and methods contains the rationale for the controls); furthermore, dissections on the parent culm revealed that the meristems were still vegetative after 150 days of growth in SD in all 51 accessions tested, consistent with our previous studies (Ream et al., 2014; Gordon et al., 2017) indicating that B. distachyon is an obligate LD plant. We refer to these 40 lines as SD-vernalization responsive and the 11 lines that did not have a SD vernalization response as SD-vernalization non-responsive. Natural variation in the short-day (SD) vernalization response in B.distachyon. (A) SD vernalization response in 51 accessions that require cold mediated vernalization. Plants were grown for 56 days in 8 hr SD before the shift into long days (LD) of 14 hr (eight rapid flowering accessions when grown in 16 hr or 20 hr, see also Figure 1—figure supplement 1) or 16 hr (43 delayed flowering accessions). Day temperature of 21°C and night temperature of 18°C. SD vernalization is equally effective when day and night temperatures are constant (see Materials and methods for details). White bars indicate accessions that are SD vernalization responsive and black bars accessions that are SD vernalization non-responsive. (B) Image of a representative SD vernalization responsive accession Koz3 and a SD vernalization non-responsive accession Bd1-1 taken after 100 days of growth. Only Koz3 flowers after the SD to LD shift whereas both accessions flower rapidly if exposed to 8 weeks of cold (8wkV) prior to growth in 16 hr LD. (C) Box plot illustrating that SD vernalization non-responsive accessions (SDV-NR, black dots) require longer periods of cold exposure to flower rapidly in 16 hr LD relative to SD vernalization responsive (SDV-R, white dots) accessions. The difference between SDV-NR and SDV-R flowering after vernalization is statistically significant. See supplemental Table S1-2 for days to heading, leaf count and standard deviation data for SD vernalization and Table S3 for days to heading data for 6 and 14 weeks of vernalization (6wkV and 14wkV). Bar = 5 cm (D) Short day vernalization response in three delayed-flowering accessions Koz3, TR12c and RON2 when shifted into 10, 12, 14, 15, and 16 h days. In this experiment, LD only and SD only control plants flowered similar to those in Table S1-2 (data not shown). Arrows indicate treatments in which plants did not flower within the experiment. Bars represent the average days to heading of 12 plants for each treatment. (E) SD vernalization time course. See Figure 1—figure supplement 1B for SD and LD only controls and Figure 1—figure supplement 1C for representative photo of plants at the end of the experiment. (F) The SD vernalization response is effective at multiple developmental stages. Koz3 and Tr12c were grown for 6, 4, 2, 0 weeks under 16 hr LD before shifting into 8 weeks of 8 hr SD (8wkSD). After the SD treatment plants were shifted back into LD. Representative photo of Koz3 taken after 40 days. See Figure 1—figure supplement 1D,E and Supplemental Table 1 and 2 for days to heading and leaf count data. Given that the longest days experienced in the native growth habitats of the B. distachyon accessions tested range between 15 and 16 hr (Figure 1—figure supplement 2), we evaluated whether the SD vernalization response was still effective when SD-grown accessions Koz3, TR12c and RON2 were shifted into a range of more native photoperiods (Figure 1D). Plants were grown in 8 hr SD for 9 weeks before shifting into 10, 12, 14, 15, or 16 hr day-lengths (Figure 1D). All three SD-responsive accessions flowered more rapidly after exposure to SD when the day-length was 12 hr or longer (Figure 1D). In B. distachyon 12 hr is the minimal day-length that is still partially inductive for flowering (Ream et al., 2014; Woods et al., 2017a). Thus, the flowering effect of SD vernalization is manifest at the same inductive photoperiods as cold-mediated vernalization. To determine if SD vernalization, like cold-mediated vernalization, is a quantitative response, we conducted a SD-exposure time course. Four SD-responsive and five non-responsive accessions were grown for 2, 4, 6, 8, 10, or 12 weeks in 8 hr SD before shifting into LD. Like cold-mediated vernalization, the SD response is quantitative—longer periods of SD exposure result in more rapid flowering in the SD-responsive accessions (Figure 1E; Figure 1—figure supplement 1C). Furthermore, 8 weeks of SD exposure saturates the SD-vernalization response. Lastly, even 12 weeks of SD exposure did not enable flowering in any of the accessions we had characterized as SD non-responsive in the 8 week SD exposure evaluation noted above. We also explored whether the SD vernalization response is possible at a range of developmental stages. In the experiments described above, the SD treatment started when imbibed seeds were sown in soil and continued until plants were shifted into LD and, thus, depending upon the length of time in SD, the SD treatment spanned a range of early developmental stages. To determine if SD vernalization is effective at later developmental stages, we grew SD-responsive accessions in LD for 2, 4, and 6 weeks and subsequently exposed them to 8 weeks of SD. 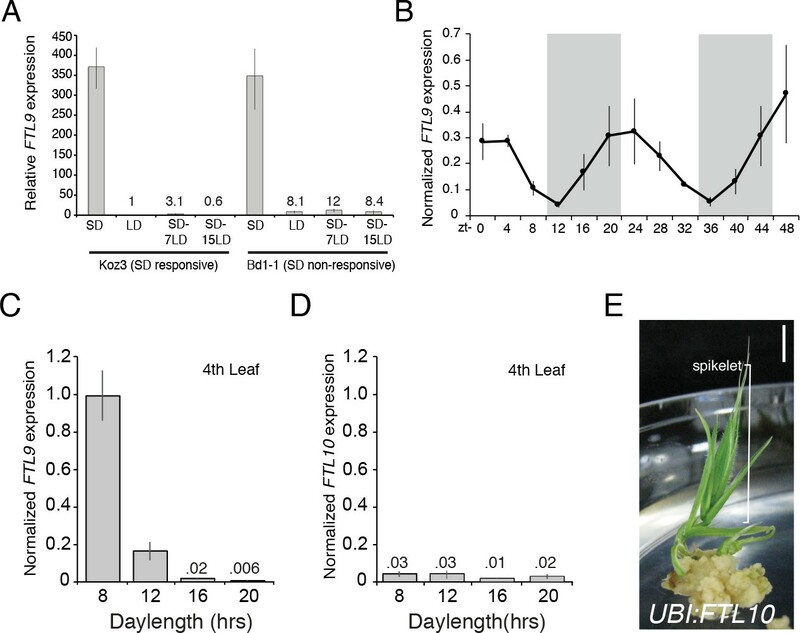 Plants were then returned to inductive LD to determine their SD vernalization responsiveness. All of the SD vernalized plants flowered within 35 days after shifting back into LD, with four additional leaves appearing on the parent culm before flowers were visible (Figure 1F; Figure 1—figure supplement 1D,E), indicating the SD vernalization is equally effective at early and later developmental stages. To explore the genetic basis of natural variation in the SD-vernalization response, we generated mapping populations from crosses between responsive and non-responsive accessions (Koz3 X Bd1-1; 12 c X Bd1-1; RON2 X Bd1-1; and Koz3 × 29–1; Figure 2—figure supplement 1). In all populations, SD responsiveness segregated as a single, dominant locus (Figure 2—figure supplement 1A) that mapped as a large-effect QTL near the bottom of chromosome 2 (Figure 2—figure supplement 1B; Figure 2—source data 1). Fine mapping using the Koz3 X Bd1-1 F2 population narrowed the interval to a region on chromosome two containing eight annotated genes (Figure 2—figure supplement 1C). None of these genes exhibited a difference in expression pattern in the shoot apical meristem or leaf tissue of responsive versus non-responsive lines grown in SD followed by LD, SD only, or LD only (data not shown), indicating that the variant underlying this trait is not likely to be in a cis-regulatory region of a gene. However, there is one gene in the interval that is preferentially expressed in SD, and this gene exhibits a one nucleotide change in all 11 SD non-responsive accessions that is not found in any of the 40 SD-responsive accessions; this change results in a threonine to lysine substitution at position 94 (T94K) in an FT paralog (Supplementary file 1–2; Figure 2—figure supplement 2; Figure 2—source data 2) referred to as FT-like 9 (Bradi2g49795; FTL9) (Higgins et al., 2010; Figure 2—figure supplement 4). The founding member of this family is FLOWERING LOCUS T (FT) which encodes a small protein with similarity to phosphatidylethanolamine-binding proteins, also known as ‘florigen’, that travels from leaves to the shoot apical meristem to induce flowering (e.g., Corbesier et al., 2007; Tamaki et al., 2007). Molecular analyses confirm that allelic variation at FTL9 is responsible for natural variation in the ability of SD exposure to confer competence to flower (Figure 2; Figure 2—figure supplement 1). First, reducing FTL9 expression in the SD-responsive accessions Koz3 and Bd21-3 using artificial microRNAs (amiRNAs) eliminates the SD-vernalization response (Figure 2A and Figure 2—figure supplement 1D–I). However, the amiRNA lines remain fully responsive to cold-mediated vernalization demonstrating that the role of FTL9 is specific to the SD-vernalization pathway (Figure 2B and Figure 2—figure supplement 1E–F). Second, constitutive expression of an FTL9 cDNA from the SD-responsive accessions Koz3 and Bd21 under the control of the maize ubiquitin promoter in both SD-responsive (Bd21-3 and Koz3) and non-responsive accessions (Bd29-1), which results in FTL9 expression in LD, causes LD-grown transgenic plants to behave as if they were vernalized without prior cold or SD treatment both in terms of accelerated flowering as well as expression of VERNALIZATION1 (VRN1), a MADS box transcription factor related to the APETALA/FRUITFUL family of genes in Arabidopsis thaliana, that is a marker of the vernalized state in grasses (Woods et al., 2014a; Yan et al., 2003; Preston and Kellogg, 2008) (Figure 2C and Figure 2—figure supplement 3). In contrast, constitutive expression of the FTL9 cDNA from the SD-non-responsive accession Bd1-1 did not affect the flowering behavior of transgenic lines (Figure 2C; Figure 2—figure supplement 3) indicating that the T94K change is likely to disrupt FTL9 function consistent with the recessive nature of this allele (Figure 2—figure supplement 1A) and that the T94K change occurs in a highly conserved amino acid in this family of proteins in plants and animals (Figure 2—figure supplement 2B). In the experiments described above we evaluated transgenic expression of FTL9 alleles from both Koz3 and Bd21-3 because FTL9 alleles from SD-responsive accessions exhibit variation in the predicted C terminus of the FTL9 protein (Figure 2—source data 2): the ancestral state of FTL9 is 178 amino acids, but in Koz3 there is a deletion of a single nucleotide (G) in amino acid 175 that alters the reading frame such that FTL9 is 184aa long. As noted above, both versions of FTL9 confer competence to flower. FTL9 is necessary for the SD vernalization response and sufficient to confer competence to flower. (A) amiFTL9 knockdown prevents SD vernalization. Koz3 wild-type and amiFTL9 knockdown plants grown in 8 hr SD for 9 weeks (9wk SD) before shifting into 20 hr LD. Bar= 5 cm. (B) amiFTL9 knockdown has no effect on cold-mediated vernalization. Plants were vernalized as imbibed seed at 5°C for 6 weeks (6wkV) before outgrowth in 20 hr LD. Bar = 5 cm. See Figure 2—figure supplement 1 for amiFTL9 details. All experiments were repeated with similar results. (C) Constitutive expression of dominant FTL9 alleles permits flowering in LD. Representative photo of Bd21-3 wild-type, UBI:FTL9 Bd21 (FTL9 from Bd21), UBI:FTL9 Koz3 (FTL9 from Koz3), UBI:FTL9 Bd1-1 (FTL9 from Bd1-1), UBI:FT1, and UBI:VRN1 grown in a 16 hr photoperiod (LD) without cold or short day vernalization. All over expression lines are in the Bd21-3 background. Bar = 5 cm. See Figure 2—figure supplement 3 for UBI:FTL9 details including days to heading, leaf count data as well as mRNA expression analyses. Overexpression of FTL9 does not result in rapid flowering when plants are grown in SD whereas overexpression of FT1 results in rapid flowering in SD (Figure 2—figure supplement 3). The lack of rapid flowering in the FTL9 overexpression transgenics is consistent with the gene providing competence to flower rather than flowering per se, whereas FT1 expression directly induces flowering in all growth conditions (Figure 2—figure supplement 3; Woods et al., 2017a). Although all SD non-responsive accessions contain the T94K change at the FTL9 locus, they do not cluster in a single group but rather are quite distantly related based on whole-genome analyses (Gordon et al., 2017; Figure 2—figure supplement 5A) raising the possibility that the T94K allele arose independently more than once. However, a phylogenetic analysis focusing on the 65 kb interval containing FTL9 indicates that in all of the SD-non-responsive accessions the 65 kb FTL9 interval is highly conserved (Figure 2—figure supplement 5B) despite other regions of the genome being divergent. This suggests that the FTL9 variant associated with loss of SD responsiveness arose once and was then maintained by positive selection throughout outcrossing to diverse accessions. Although, B. distachyon is typically inbreeding, outcrossing occurs as well (Sancho et al., 2018). That a lesion in FTL9 that appears to have undergone positive selection arose once is in contrast to the loss of a vernalization requirement in Arabidopsis thaliana which arose independently many times due to loss-of-function mutations in FRIGIDA (Le Corre et al., 2002). Perhaps the T94K change does not result in a complete loss of function, but rather retains a function distinct from its role in SD vernalization. The adaptive value of an active FTL9 and a SD-vernalization response, which is the ancestral state, may be to ensure that vernalization occurs in mild climates in which SD may be a more reliable indicator of winter than cold. The adaptive value of loss of FTL9 activity and the corresponding loss of the SD-vernalization response might be to enable B. distachyon to grow in regions with a more variable spring climate in which a robust SD-vernalization response might lead to flowering before the danger of a hard freeze, which would damage sensitive floral organs, had passed. Interestingly, the SD-non-responsive accessions also require a longer period of cold exposure than the SD-responsive accessions to become fully vernalized (Gordon et al., 2017 and Figure 1C; Supplementary file 3) which is consistent with the SD-non-responsive accessions having undergone adaptation for later spring flowering. Also, consistent with this model of the adaptive value of loss of FTL9 activity, the non-responsive accessions tend to have been collected at higher latitudes than the responsive accessions (Figure 1—figure supplement 2); however, latitude is only one of many factors that may relate to the latest date of a damaging freeze. Consistent with its role in SD vernalization, FTL9 mRNA is barely detectable in LD, whereas its expression is 350-fold greater in SD (Figure 3A). When SD-grown plants are shifted to LD, FTL9 mRNA levels decline within a few days (Figure 3A). We tested whether the quantitative aspect of SD vernalization might be correlated with increasing expression of FTL9 during the course of growth in SD, but FTL9 mRNA levels remained the same over 10 weeks of SD exposure (Figure 3—figure supplement 1D). Finally, FTL9 exhibits a diurnal expression pattern in SD with mRNA levels increasing during the night to a peak at dawn and declining during the day to a minimum at dusk. In LD there is no detectable diurnal expression difference; FTL9 expression remains low throughout a 20 hr LD (Figure 3B and Figure 3—figure supplement 1A). When plants are shifted from SD to free-run, constant-dark conditions, FTL9 mRNA levels plummeted and did not oscillate, indicating that diurnally oscillating FTL9 expression requires short day/long night cycles (Figure 3—figure supplement 1B). FTL9 expression is SD specific and diurnally fluctuating whereas FTL10 expression is not influenced by day-length and encodes a florigenic protein. (A) FTL9 mRNA levels in Koz3 and Bd1-1 grown solely in 8 hr SD, solely in 20 hr LD, or 7 or 15 days after a shift from 8 weeks in SD to LD. Dissection of meristems on the parent culm revealed that all remained meristems vegetative in both Koz3 (12 dissected meristems) and Bd1-1 (12 meristems) in SD and LD grown plants. After a shift from SD to LD at day 7 all of the meristems were vegetative in Koz3 and Bd1-1 (12 meristems for each accession), however by day 15 in LD all of the meristems had converted to floral meristems in Koz3 (12 meristems) whereas they remained vegetative in Bd1-1 (12 meristems). RNA was prepared from newly expanded leaves on the parent culm. (B) Diurnal FTL9 mRNA fluctuations in 8 hr SD. Plants were grown in SD until the fourth-leaf stage was reached at which point newly expanded leaves were harvested every 4 hr throughout a 48 hr diurnal cycle. Shaded boxes represent dark periods. (C) FTL9 and (D) FTL10 mRNA levels in 8, 12, 16, and 20 hr photoperiods. Koz3 was grown to the four-leaf stage and newly expanded leaves were harvested in the middle of the photoperiod. (E) Representative image of T0 generation UBI:FTL10 plants showing rapid spikelet formation (bracket) on callus regeneration media. All 15 independent UBI:FTL10 calli flowered rapidly in regeneration media. Those plants without the transgene did not flower rapidly. UBI:FTL10 T1 generation days to heading and leaf count data see Figure 2—figure supplement 3. Bar = 0.5 cm. (A–D) Values represent the average of three biological replicates ± standard deviation (four leaves per replicate). Similar results were obtained in independent experiments. Gene expression was normalized to UBC18 as described in Ream et al. (2014). FTL9 is part of a FT-like gene family that has expanded to 14 members in grasses (Higgins et al., 2010 and Figure 2—figure supplement 4). The roles of the other FT-like genes in grasses have not been thoroughly explored. Studies in wheat and barley indicate that a candidate gene underlying a QTL that confers the ability of certain varieties to flower in SD (Ppd-H2) (Laurie et al., 1995) is a paralog of FT referred to as FT3 (Faure et al., 2007; Kikuchi et al., 2009; Casao et al., 2011a). The dominant FT3 allele, which enables SD flowering, is often found in spring barley cultivars grown in more southern latitudes, whereas the recessive allele is typically associated with winter cultivars grown in more northern latitudes (Casao et al., 2011a). FT3 is implicated in actual flowering in SD in barley as opposed to the competence to flower in LD that is conferred by SD-specific expression of FTL9 in B. distachyon. FTL10 (Bradi2g19670) is the B. distachyon ortholog of barley FT3 (Higgins et al., 2010; Halliwell et al., 2016; Figure 2—figure supplement 4). FTL10 and FTL9 are closely related paralogs that resulted from a grass-specific duplication event, and thus FTL10 and FTL9 reside in sister clades (Figure 2—figure supplement 4). FT3 is up-regulated in SD in barley (Faure et al., 2007) and wheat (Lv et al., 2014), whereas FTL10 expression in B. distachyon is not modulated by day-length and its expression level is quite low in all photoperiod and temperature conditions tested (Figure 3D). Due to its minimal expression, FTL10 may not play a role in B. distachyon flowering. However, constitutive expression of FTL10 from the maize ubiquitin promoter results in flowering during transgenic line generation in tissue culture (Figure 3E) and rapid flowering in SD (Figure 2—figure supplement 3I,J) similar to the effects of expression of other FT1 orthologs in B. distachyon (Figure 2—figure supplement 3I,J; Ream et al., 2014) and wheat (Lv et al., 2014) indicating that FTL10 has the ability to induce flowering. Thus, the FT3/FTL10 orthologs in this grass-specific duplication event have diverged in barley and wheat versus B. distachyon. In barley and wheat, FT3 has retained its presumably ancestral role of being expressed in SD which leads to flowering in SD. B. distachyon cannot flower in SD because its ortholog, FTL10, is no longer expressed. As discussed above, constitutive expression in B. distachyon of the other duplicated gene, FTL9, does not induce flowering in SD or in tissue culture because its role is to establish competence to flower as opposed to the florigen-like role of FTL10/FT3 in inducing flowering (Figure 2—figure supplement 3G,I,J). SD-expressed FT family members emerged early in grass diversification. For example, like FTL9 in B. distachyon, the FTL9 ortholog in sorghum and maize (CENTRORADIALIS 12; CN12) (Figure 2—figure supplement 4, Figure 2—figure supplement 6) is also expressed only in SD (Murphy et al., 2011; Meng et al., 2011; Wolabu et al., 2016). However, in sorghum and maize, which are SD-flowering or day neutral plants, CN12 and SD expressed CN8 (the FTL10/FT3 ortholog) are both florigenic similar to FTL10/FT3 (Meng et al., 2011; Lazakis et al., 2011; Wolabu et al., 2016). Thus, gene duplication of an ancestral SD-expressed FT-like gene at the base of the grass family appears to have resulted in the FTL9/CN12 and FTL10/FT3/CN8 clades (Figure 2—figure supplement 4). Grasses that are classified as SD plants like sorghum and photoperiodic maize (Murphy et al., 2011; Meng et al., 2011) are in fact SD plants because a florigenic member of one of the SD-expressed clades provides the primary florigen activity. Wheat and barley are LD plants because the strongest florigen activity is provided by LD-expressed FT family members in other clades such as FT1. However, many varieties of wheat and barley exhibit a facultative LD response—that is they also can flower in SD. The SD flowering of barley appears to result from expression of SD-induced clade members such as FT3 (Kikuchi et al., 2009; Faure et al., 2007). There are other barley varieties that do not flower in SD because their FT3 alleles have lesions in the coding region (Kikuchi et al., 2009). All accessions of B. distachyon that we have analyzed are obligate LD plants because the florigenic member of the clade, FTL10, is not expressed at sufficient levels to cause flowering in SD and the other member of the clade, FTL9, evolved the different function of providing competence to flower rather than directly promoting flowering like it does in sorghum and maize. SD-mediated vernalization was first described in rye in 1937 (Purvis and Gregory, 1937) and has been described in wheat and barley (Evans, 1987; Heide, 1994; Dubcovsky et al., 2006); however, sequence data available to date have not revealed a clear ortholog of FTL9 in wheat or barley (Figure 2—figure supplement 4; Faure et al., 2007). It will be interesting to determine whether FTL9 orthologs or other FT family members are involved in SD vernalization in cereals. Gene duplication and divergence has enabled diverse roles for FT family members in flowering. The founding members of the FT family provide florigen activity (Corbesier et al., 2007; Tamaki et al., 2007). In beet, an FT family member is an inhibitor of flowering that is key to establishing a requirement for vernalization (Pin et al., 2010). Our work in B. distachyon reveals a new role for an FT family member: the establishment of competence to flower without direct florigen activity. Given the day-length dependence of FTL9 expression, we analyzed its expression in a phyC-1 mutant background (Woods et al., 2014a). PHYTOCHROME C (PHYC) is a red light receptor and in phyC mutants the LD photoperiod flowering pathway is abolished and mutant plants are extremely delayed in flowering and have the appearance of SD-grown plants when grown under LD (Woods et al., 2014a). Indeed, FTL9 expression is significantly elevated in phyC mutants grown in LD compared to wild type across all time points tested (Figure 4A). Thus, certain PHYC-regulated genes may be negative upstream regulators of FTL9. One candidate gene is FT1; in barley cultivars that can flower in SD, HvFT1 has been postulated to be a repressor of HvFT3—the SD-expressed paralog of FTL9 discussed above (Figure 2—figure supplement 4) —because relatively high HvFT3 expression in SD precedes the expression of HvFT1 and, as HvFT1 expression levels increase in SD, HvFT3 expression decreases (Kikuchi et al., 2009). The same correlation of expression patterns exists in B. distachyon; for example, in the phyC mutant in LD, FT1 is nearly undetectable (Woods et al., 2014a), and FTL9, as noted above, is highly expressed, whereas in wild type FT1 is expressed in LD and FTL9 is not. To determine if FT1 represses FTL9 in B. distachyon, we evaluated FTL9 expression in UBI:FT1 transgenic lines grown in SD, a condition in which BdFT1 is not expressed in wild-type plants. FTL9 expression levels were similar between UBI:FT1 and wild-type (Figure 2—figure supplement 3H); thus, it is unlikely that FT1 acts as a LD repressor of FTL9 in B. distachyon. VRN2 represses FTL9 in LD. (A) Gene expression of FTL9 in Bd21-3 (grey line) and phyC (black line; phyC-1 allele was used). Plants were grown in LD (20 hr days) until the fourth leaf stage was reached at which point the newly expanded fourth leaf was harvested at zt0, zt6, zt9, zt12, zt15 and zt20. The average of three biological replicates is shown ± standard deviation (three leaves per replicate). (B) VRN2 is most highly expressed in LD. VRN2 mRNA levels in Koz3 and Bd1-1 grown solely in 8 hr SD, solely in 20 hr LD only, or 7 and 15 days after a shift from SD to LD. Samples as described in Figure 3A. See Figure 3A legend for description of the state of the meristem throughout experiment. (C) FTL9 is expressed in LD when VRN2 expression is reduced. FTL9 mRNA levels were assessed by qRT-PCR in samples from a newly expanded leaf of Bd21-3 and amiVRN2 plants at the fourth-leaf stage grown in 16 hr LD. (D) FTL9 expression is reduced in SD if VRN2 is constitutively expressed. FTL9 mRNA levels were determined as in C. (C,D) Average relative FTL9 expression is shown for four biological replicates ± standard deviation (four leaves per replicate). Asterisk indicates a p-value < 0.05. See Figure 4—figure supplement 1 for VRN2 expression. (E) Constitutive VRN2 expression blocks the SD vernalization response. Days to heading for three independent amiVRN2 transgenic lines (white bars) grown in SD for 10 weeks before shifting to 14 hr LD; wt Bd21-3 and segregating non-transgenic plants (black bars) show a normal SD vernalization response. Bars represent the average of 12 plants ± standard deviation. VERNALIZATION2 (VRN2) which contains a putative zinc finger and a CONSTANS, CONSTANS-like, and TIMING OF CAB1 domain (Yan et al., 2004) is another candidate gene that might repress FTL9 during LD because VRN2 expression is abolished in the phyC mutant (Woods et al., 2014a) and the level of FTL9 expression is inversely correlated with the level of expression of VRN2 (Figure 4B and Figure 4—figure supplement 1A). VRN2 is a flowering repressor, and its expression is a function of day-length (Figure 4B and Figure 4—figure supplement 1A) (Dubcovsky et al., 2006; Woods et al., 2016). In LD, VRN2 mRNA levels are elevated and FTL9 mRNA is barely detectable, whereas in SD VRN2 mRNA levels are low and FTL9 is highly expressed (Figure 4—figure supplement 1A). When plants are shifted from SD to LD, VRN2 levels rise to LD levels (Figure 4B), and FTL9 expression subsides (Figure 3A). This expression pattern contrasts with that of VRN2 in a SD-vernalization responsive variety of wheat in which VRN2 levels remain at low SD levels after a shift to LD (Dubcovsky et al., 2006). In wheat, VRN2 is down-regulated by both cold and short days suggesting that this gene might play a role in the integration of the SD vernalization and vernalization pathways (Dubcovsky et al., 2006). This is unlikely to be the case in B. distachyon as VRN2 is up-regulated during the cold (Ream et al., 2014) and VRN2 down-regulation in SD is not maintained during a SD-LD shift (Figure 4B). That VRN2 controls FTL9 expression in B. distachyon is supported by the upregulation of FTL9 in LD when VRN2 expression is suppressed by amiRNAs (Figure 4C and Figure 4—figure supplement 1B) and the lack of FTL9 expression and lack of acquisition of competence to flower in SD when VRN2 is constitutively expressed (Figure 4D–E and Figure 4—figure supplement 1C). Thus, VRN2 is a repressor of flowering that creates a requirement for vernalization by suppressing flowering when the days are sufficiently long, and, when the day-length decreases below a threshold in winter, the lack of VRN2 expression permits FTL9 expression which leads to competence to flower. The regulation is one way: over- or under-expression of FTL9 does not affect VRN2 mRNA levels (Figure 2—figure supplement 3D). The repression of FT family genes by LD-upregulated VRN2 appears to be conserved in grasses. For example, in rice, in which SD are inductive for flowering, expression of the VRN2 ortholog GHd7 (Woods et al., 2016) is reduced in SD enabling expression of Hd3 which encodes a florigen (Xue et al., 2008). Also, in wheat and barley, the florigen FT3 is expressed in SD, and this SD-specific expression of FT3 is correlated with lower levels of VRN2 expression in SD (Dubcovsky et al., 2006; Kikuchi et al., 2009; Casao et al., 2011b). Furthermore, in barley varieties with loss of function mutations in VRN2 results in elevated FT3 expression under LD conditions that do not typically induce its expression (Casao et al., 2011b). To explore the relationship between SD vernalization and cold-mediated vernalization, we evaluated the expression of the key flowering genes VRN1 and FT1 (known as VRN3 in wheat, Yan et al., 2006) in SD, LD, and during a SD-LD shift (Figure 5). FT1 and VRN1 are lowly expressed in SD only and LD only in Koz3 and Bd1-1 consistent with the delayed flowering phenotype of these accessions without prior SD or cold exposure (Figure 5). Furthermore, dissections on the parent culm revealed that the meristems were vegetative in both Koz3 and Bd1-1 when grown only in SD or in LD for the duration of the experiment. However, prolonged exposure of Koz3 (SD vernalization responsive) to SD followed by a shift to LD (SD-LD) results in the up-regulation of both FT1 and VRN1, whereas this treatment does not result in FT1 and VRN1 expression in the SD non-responsive accession Bd1-1 (Figure 5). In Koz3 all of the meristems had converted to floral meristems by day 15 after shifting into LD whereas the meristems remained vegetative in the Bd1-1 accession. Thus, SD vernalization provides competence to flower by enabling the expression of VRN1 and FT1 once plants are in LD. As previously shown for cold-mediated vernalization (Woods et al., 2016), SD-mediated vernalization is attenuated in amiVRN1 transgenic lines (Figure 5C,D), further corroborating that the cold- and SD-mediated vernalization pathways converge on enabling expression of genes like VRN1 when plants are exposed to inductive LD. It is important to note that the loss of FTL9 activity has no effect on cold-mediated vernalization (Figure 2) demonstrating that there are features that define the two pathways as separate. It will be interesting to determine mechanisms through which FTL9 expression in SD enables an alternate path to cold-mediated vernalization to provide competence to flower. This competence is due, at least in part, by enabling VRN1 expression to increase in LD. For example, FTL9 may be involved in modifying VRN1 chromatin during SD to allow its activation during LD. A similar model applies to the cold-mediated vernalization pathway: for example, repression of VRN1 before cold-mediated vernalization is associated with high levels of H3K27me3 at VRN1 chromatin in both barley and B. distachyon (Oliver et al., 2009; Lomax et al., 2018; Woods et al., 2017b). 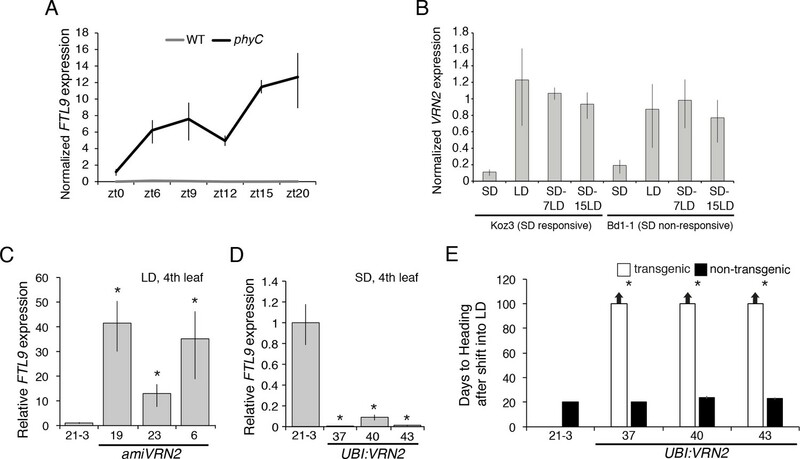 SD vernalization induces the floral promoting genes FT1 and VRN1 in LD and the SD vernalization response depends on VRN1 expression. (A) VRN1 and (B) FT1 mRNA levels in Koz3 and Bd1-1 grown solely in 8 hr SD, solely in 20 hr LD, or 7 or 15 days after a shift from 8 weeks in SD to LD. See Figure 3A legend for description of the state of the meristem throughout experiment. RNA was prepared from newly expanded leaves on the parent culm. Values represent the average of three biological replicates ± standard deviation (four leaves per replicate). The experiment was repeated with similar results. Expression normalized to UBC18 as in Ream et al. (2014). (C) Knockdown of VRN1 expression blocks the SD vernalization response. Representative photo of Bd21-3 wild-type, and amiVRN1 grown in 8 hr photoperiod (SD) only, 14 hr photoperiod (LD) only and after a shift from 8 weeks in SD to LD. Bar = 5 cm. (D) Days to heading for three independent amiVRN1 transgenic lines (4,5,6; white bars) grown in SD for 10 weeks before shifting to 14 hr LD; wt Bd21-3 and segregating non-transgenic plants (black bars) show a normal SD vernalization response. Bars represent the average of 12 plants ± standard deviation. Similar to cold-mediated vernalization, the SD-mediated vernalization response is found in an array of species spanning flowering plant diversification (Chouard, 1960; Heide, 1994). Advances in understanding the molecular underpinnings of cold-mediated vernalization in several different plant groups as well as knowledge from paleobotany and earth climate history indicate that cold-mediated vernalization likely evolved independently multiple times as flowering plants were radiating some 140 million years ago (e.g., Bouché et al., 2017). The fact that FTL9 appears to be grass-specific but SD-mediated vernalization exists in other groups of plants suggests that SD-mediated vernalization likely evolved independently several times as well. It will be interesting to evaluate the molecular basis of SD-vernalization pathways in different plant groups. Seeds were imbibed overnight in distilled water at 5°C then grown in MetroMix 360 (Sungrow) in 3-inch plastic pots under four 5000 K T5 fluorescent bulbs (300 mmol m–2 s–one at plant level) at 21–22°C during the light period and 18°C during the dark and fertilized weekly with Peters Excel 15-5-15 Cal-Mag and Peters 10-30-20 Blossom Booster (RJ Peters). To minimize light intensity differences, plant positions were rotated several times per week. Flowering time was measured as the number of days from the emergence of the coleoptile to the day when emergence of the spike was visible. The developmental stage of the plant was recorded as the number of primary leaves derived from the parent culm at the time of heading. For all experiments at least six plants were used to obtain the days to heading and leaf count averages. Representative phenotyping results are presented, each of which were repeated in independent experiments with similar results. Development of indel markers (Supplementary file 4) was done using the sequenced genomes of Koz3, Bd1-1, 12 c, Bd29-1, and RON2 (Gordon et al., 2017). All markers are optimized to anneal at 51°C and produce a product roughly 100 bp in length. Markers were resolved using a 3% sodium borate agarose gel. amiRNAs specific for two distinct parts of the FTL9 mRNA were designed using the amiRNA designer tool at wmd3.weigelworld.org based on MIR528 from rice in the pNW55 vector. Gateway-compatible amiFTL9 PCR products were recombined into pDONR221 using Life Technologies BP Clonase II following the manufacturer’s protocol. Clones were verified by sequencing. The pDONR221 vector containing the desired amiRNA in combination with another vector containing the maize ubiquitin promoter were both recombined into destination vector p24GWI (designed by Devin O’Connor at the Plant Gene Expression Center, Albany, CA) using Life Technologies LR clonase II plus following the manufacturer’s protocol. Clones were verified by sequencing to ensure that the maize ubiquitin promoter was upstream from the amiRNA. The constructs were transformed into A. tumefaciens strain Agl-1. Plant callus transformation was as previously described (Vogel and Hill, 2008). Independent transgenic lines were genotyped for the transgene using an amiRNA forward primer specific for the targeted transcript and a reverse primer derived from the pNW55 backbone sequence (Supplementary file 5). Primers used to generate the amiRNAs are listed in Supplementary file 5. FTL9 cDNAs were amplified from SD-grown Bd21, Koz3, and Bd1-1 plants. FTL10 cDNAs were amplified from Bd21-3 grown in LD. cDNAs were gel extracted (Qiagen) and cloned using CloneJET PCR according to the manufacturer’s protocol (Thermo Fischer Scientific). Clones were verified by sequencing. The cDNA was then subcloned using primers compatible with the Gateway BP clonase system according to the manufacturer’s protocol (Thermo Fischer Scientific). The BP plasmid was verified by sequencing and then recombined into pANIC10A (Mann et al., 2012) using Life Technologies LR Clonase II following the manufacturer’s protocol. Clones were verified by sequencing in pANIC10A and then transformed into Agrobacterium tumefaciens strain Agl-1. Plant callus transformation was performed as described (Vogel and Hill, 2008). Independent transgenic lines were genotyped for the transgene using a cDNA-specific forward and pANIC vector AcV5 tag reverse primer (Supplementary file 5). Primer pairs used to clone each cDNA are listed in Supplementary file 5. RNA extraction and expression analysis were performed as described in Ream et al. (2014). QTL analysis was performed as described in Woods et al. (2017a). Phylogenetic analyses of FT-like genes were performed using both the full-length FTL9 and FT genes and the PEBP domains as seed sequences for BLAST searches using Phytozome and NCBI as described in Woods et al. (2011). Maximum-likelihood analyses were conducted using SeaView 4.5.4 (Gouy et al., 2010). Phylogenetic analysis of the SD-vernalization interval across 51 B. distachyon accessions was done using variants called within a VCF file generated as in Gordon et al. (2017). Relationships among B. distachyon accessions based on the mapped interval were determined using the TASSEL five software package (Bradbury et al., 2007). Synteny in the chromosomal regions around FTL9 of Brachypodium distachyon, Oryza sativa, Seteria italica, Sorghum bicolor, Panicum hallii, and Zea mays was investigated using the GEvo software package within CoGe (Lyons and Freeling, 2008). To determine if prolonged growth in short days followed by a shift into long days (SD-LD) can promote flowering, we grew 43 delayed flowering accessions in 8 hr short days for 8 weeks before shifting into either 16 or 20-hr days (Supplementary file 1–2). The two controls for this experiment were accessions grown in SD and LD only. The SD only control demonstrates that growth in SD is indeed non-inductive for flowering because growth for 150 days does not permit flowering in any of the accessions tested (Supplementary file 1–2). Dissections on the parent culm revealed that the meristems were still vegetative after 150 days of growth in SD in all 51 accessions tested, consistent with previous reports (Woods et al., 2014a; Gordon et al., 2017). The LD only control was chosen to ensure that if robust flowering occurs following a shift from SD to LD, this was indeed due to the prior SD treatment and not simply due to the age of the plant when shifted into inductive LD. Thus, an accession is SD vernalization responsive if the SD-LD shifted plants flower much more rapidly than the LD only controls. To ensure the acceleration of flowering by prolonged exposure to SD was indeed due to the shorter photoperiod and not due to extended periods of cooler dark temperatures of 18°C, we grew four accessions (KOZ3, 12 c, RON2 and Bd18-1) in SD under constant day and night temperatures of 21°C. Accessions grown under constant 21 °C day/night temperatures showed the same robust SD vernalization response as those grown under 21°C/18 °C day/night temperatures (data not shown), indicating that the SD vernalization phenomenon is due strictly to the photoperiod and not a composite of photoperiod and temperature. Journal of Experimental Botany 62:1939–1949. Annual Review of Plant Physiology 11:191–238. Frontiers in Plant Science 5:431. Frontiers in Plant Science 7:857. Journal of Experimental Botany 62:4833–4842. Molecular Biology and Evolution 19:1261–1271. The Plant Journal : For Cell and Molecular Biology 93:871–882. Cold Spring Harbor Symposia on Quantitative Biology 77:105–115. Canadian Journal of Plant Science 52:471–482. Journal of Experimental Botany 60:2169–2178. Trends in Plant Science 12:352–357. Annual Review of Cell and Developmental Biology 33:555–575. Molecular Biology and Evolution 28:2147–2159. Frontiers in Plant Science 5:99. Dissecting the Control of Flowering Time in Grasses Using Brachypodium Distachyon, Genetics and Genomics of Brachypodium, Cham, Switzerland, Springer International, 10.1007/7397_2015_10. Thank you for submitting your article "A florigen paralog is required for short-day vernalization in a pooid grass" for consideration by eLife. Your article has been reviewed by two peer reviewers, and the evaluation has been overseen by Hao Yu who is a member of our Board of Reviewing Editors and Christian S. Hardtke as the Senior Editor. The reviewers have opted to remain anonymous. This paper investigates the mechanism underlying the poorly understood phenomenon of short-day induced vernalization in the pooid grass Brachypodium distachyon. The authors study why many accessions of Brachypodium have the ability to perceive seasonal cues important for the release of flowering repression during winter, not only by perceiving cold signal, but also by responding to short photoperiods. 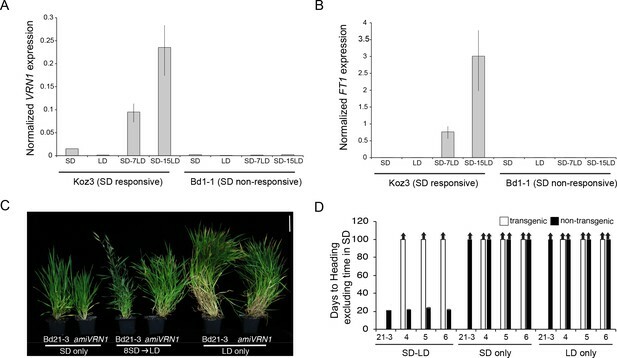 The authors identify that an FT-like gene called FTL9 is expressed in short days and required for conferring Brachypodium accessions a rapid flowering response when they are transferred to long days. They further demonstrate that accessions without this flowering response carry a characteristic amino acid change in a conserved region of FTL9, suggesting that allelic variation of FTL9 contributes to natural variation for Brachypodium's flowering response to short days. In addition, the authors show that FTL9 expression is repressed in long days by VRN2, and its effect on flowering under short days is mediated by two floral activating genes VRN1 and FT1. Taken together, this paper presents some mechanistic understandings of short-day vernalization, which has previously been described only at the physiological level. The results also provide a new example of how different FT paralogs can evolve new functions to expand the plant ability to fine-tune their flowering time in response to different environmental conditions. The physiological and molecular genetic data are clearly presented and well designed, and the overall findings are of considerable general interest. We suggest the following revisions before this manuscript could be further considered in eLife. 1) We suggest that the authors perform microscopic analysis of meristems during short day treatment of responsive lines versus the lines with the inactive FTL9 allele. Currently scoring of flowering is carried out purely at the whole plant level by counting the number of days until "the emergence of the spike was visible". However, FTL9 might promote the floral transition under short days, but the spikes might not visibly emerge until the plants are transferred to long days. Such a result would alter the conclusion in this manuscript as it would indicate that flowering actually occurs in short days, which, however, is invisible because the spike does not grow out until the plant is exposed to long days. Thus, it is useful and important to dissect meristems during the short-day treatment and after the shift to long days in a short-day responsive and a short-day non-responsive variety. Such a dataset would add another level of phenotypic analysis to the paper and would strengthen the conclusion that an active FTL9 allele is required for the acquisition of floral competence without a direct effect on inducing flowering. 2) All short-day non-responsive types seem to harbor the same FTL9 allele. The text and the results shown in Figure 1—figure supplement 2 suggest that this is an inactive allele caused by a single amino acid change in a highly conserved residue. However, if there is strong selection for a straightforward loss of function allele in certain environments, as suggested, then we would expect many different alleles to arise independently in different populations, as for example, shown for FLC and FRI in populations of Brassicaceae species. This presence of the same FTL9 allele in all populations that have lost the response suggests that it might not simply be a complete null but might retain some function that causes this specific allele to be selected for whenever short-day vernalization is lost. Some discussions on the properties of the "loss of function" FTL9 allele along these lines would be worthwhile. 3) The results on FTL10 shown in Figure 3 are not convincing to indicate its florigen activity. The native FTL10 expression in Brachypodium is not modulated by day-length and is also very low in all conditions tested. 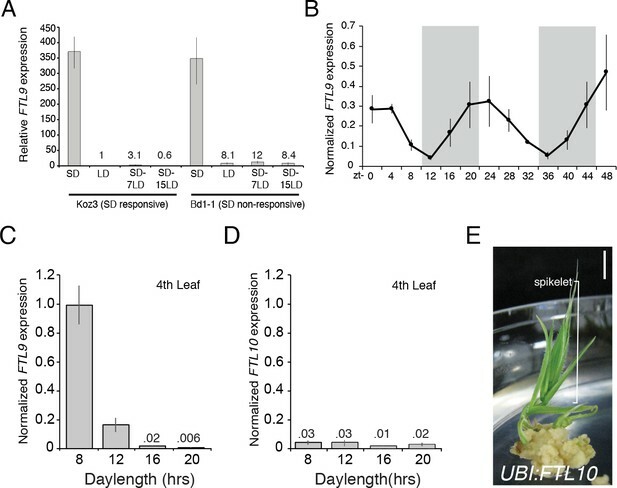 Although constitutive expression of FTL10 induces flowering under tissue culture conditions and short days, this might not reflect its endogenous function relevant to control of flowering time. Thus, the conclusion on FTL10 function in the context of Figure 3 should be revised by either showing more pieces of evidence or toning down the claim on its role. 4) To make the paper as accessible as possible to a broad readership, it would be useful to ensure that all gene products are properly introduced on first mention. For example, in subsection “FTL9 is repressed in LD by VRN2”, VERNALIZATION2 is first mentioned without a description of the nature of its protein product. We suggest citing the original paper(s) describing the isolation of the VRN2 gene. Introduction for some other genes is similarly lacking in this manuscript. 5) Some figure panels are not cited in order in the text. For example, Figure 4E is mentioned in the text before Figure 4A-D, while Figure 3D and E are mentioned after Figure 4. The authors must re-arrange the figure panels to describe them in an appropriate order in the text. In addition to dissecting meristems for nearly all the experiments we not only counted days to heading but also the number of leaves formed on the parent culm as a metric for flowering which we indicate in the Materials and methods section as “The developmental stage of the plants was recorded as the number of primary leaves derived from the parent culm at the time of heading.” Counting leaves also reflects the state of the meristem as once a vegetative meristem converts to a floral meristem no new leaves on the tiller will be made. In cases where we report a non-flowering phenotype there are higher leaf numbers compared to accessions that flowered at an early date indicating that the meristem in the parent culm is still vegetative. We are grateful to receive this comment because we do not want this key point to be misunderstood. We are NOT making any claims about the "endogenous function [of FTL10] relevant to control of flowering time." Indeed, expression data to date is consistent with no function - the RNA is barely detectable by PCR under a range of conditions - and FTL10 may in effect be a pseudogene. Nevertheless, the coding region is intact and the FTL10 protein can trigger flowering unlike FTL9 which causes competence. This is a key point of divergence of some cereal crops and Brachypodium: in some cereal crops the FTL10 ortholog is robustly expressed in short days and this can account for flowering in short days which does not occur in Brachypodium. It is important to keep in mind that not all genes with intact coding regions have roles. Evolution is a continuum and any given “snapshot” of this continuum is likely to reveal “pseudogenes” which have lesions in coding regions or regulatory elements. We now add some introductory information about the genes discussed upon first mention. Subsection “Genetic mapping of the SD vernalization response identifies an FT paralog” “The founding member of this family is FLOWERING LOCUS T (FT) which encodes a small protein with similarity to phosphatidylethanolamine-binding proteins […]”. Subsection “FTL9 is repressed in LD by VRN2” “PHYTOCHROME C (PHYC) is a light receptor and in phyC mutants […]”. Subsection “FTL9 is repressed in LD by VRN2” “VERNALIZATION2 (VRN2) which contains a putative zinc finger and a CONSTANS, CONSTANS-like and TIMING OF CAB1 domain (Yan et al., 2004) […]”. We moved Figure 4E to the Figure 4A slot and adjusted the rest of the figure so now everything is stated in order in the main text. We also move the sections “Loss of the SD-vernalization response arose once in B. distachyon” and “Roles of SD expressed FT-like genes in grass flowering” before the “FTL9 is repressed in LD by VRN2” section so now all of the figure panels are cited in order in the text. We thank John Vogel and Sean Gordon for leading the effort to sequence and analyze 51 B distachyon genomes (Gordon et al., 2017) which provided data critical for this work. We thank Jill Mahoy and Heidi Kaeppler for providing transgenic B distachyon lines, and Scott Woody for many helpful suggestions on improving this manuscript. This material is based upon work supported in part by the Great Lakes Bioenergy Research Center, US Department of Energy, Office of Science, Office of Biological and Environmental Research under Award Numbers DE-SC0018409 and DE-FC02-07ER6449. Funding was also provided by the National Science Foundation to RA (IOS-1258126), and a National Institutes of Health-pre-doctoral training grant to the University of Wisconsin Genetics Training program. The funders had no role in study design, data collection and interpretation, or the decision to submit the work for publication. © 2019, Woods et al.